As a service company, we recognize that buying a service is a very different kind of transaction than purchasing a product. A physical product exists in the real world prior to the transaction being made. It can be easily inspected and returned if it does not meet the consumer’s needs or expectations. In contrast, when a customer signs a contract for commercial landscape services, all they are really doing is accepting a promise—an agreement that the service will be provided sometime in the future. This requires a certain degree of trust on the part of the consumer. Even with the most meticulously written-up contract, a lot goes unsaid with this type of transaction. And in many cases, the buyer may not be focused on or even aware of certain things that may potentially have a huge impact on the quality of the service they ultimately receive. For this reason, we decided to articulate and clarify the promises implicit in the contract each time we agree to perform commercial landscape services. For us, our brand promises help us stay accountable to the high standards we have set for our company and the services we provide. For our customers, we hope they will serve to deepen their understanding of certain issues they should be aware of when they hire a commercial landscape contractor, as well as provide assurance that the services they receive from us will truly live up to the highest standards of the industry. 1. We promise to adhere to the highest standards of the landscape industry by maintaining our status as a Landscape Industry Accredited Company. Many buyers are unaware that the landscape industry has standards in place for best business practices. The highest level of achievement a landscape company can earn is to become accredited through the National Association of Landscape Professionals (NALP). We were not only the first Kentucky landscape company to receive NALP accreditation, but one of the first in the country. When you are buying services from an unknown vendor, the qualification process can be daunting. It can be hard to tell one brand from another without actually doing business with them or at least spending a great deal of time getting to know them. With landscape industry accreditation, the qualification process has already been done on your behalf, without your having to invest undue time or risk a bad experience. It provides third party assurance to both new and existing customers that they can expect to receive service that lives up to industry standards. Landscape industry accreditation is a rigorous process. To become an accredited vendor, we had to submit proof that we have conducted ourselves responsibly as a company, and that we adhere to industry best practices for safety, quality and integrity. We have incorporated many of these best practices into the following Brand Promises, starting with Brand Promise #2. 2. We promise to employ the most qualified staff by maintaining a minimum ratio of 1 Landscape Industry Certified professional to every 10 employees. We have always encouraged our employees to pursue certification, which is one reason we were able to achieve accreditation so quickly after the program became available in 2017. Having Landscape Industry Certified professionals on staff raises the bar for everyone in our company. It pushes all employees to new levels of competency and integrity, and helps create leaders within our ranks. This is one of the best ways we are aware of to maintain high quality of service and an outstanding safety record. 3. We promise to provide high quality plants that adhere to American Nursery Stock Standards (ANSI 60.1). Another thing many commercial landscape services buyers may not be aware of is that there are standards for nursery stock and plant material. Low bids in commercial landscaping can be an indication that a company plans to purchase substandard stock at a discount. As a rule, cheap plants will not be as healthy or attractive as ones that adhere to the American Standard for Nursery Stock. While they may appear to be cost effective up front, over time they will not deliver optimal value. Sickly plants don’t look attractive, and they may require greater amounts of water and care. Worse, they may have to be replaced prematurely, often at greater overall cost than simply planting healthy specimens in the first place. 4. We promise to employ only individuals who may legally work in the United States by participating in E-Verify. It is federal law that employers only employ individuals legally authorized to work in the United States. Undocumented workers can pose a legitimate security and liability risk. For this reason, we decided it was in the best interest of both ourselves and our customers to reduce the risk by e-verifying all our staff to ensure that every employee is legally authorized to work in the U.S.
5. We promise to employ drivers who meet the licensing requirements of the US Department of Transportation (DOT) to operate commercial vehicles. There are real safety risks associated with driving a 50’ long, 26,000 lb truck and trailer. Our customers want to know our drivers meet legal requirements for operation—and so do we! 6. We promise to provide the safest workforce through pre-employment background checks, drug screening, and our award winning safety and risk management program. There is risk in doing any kind of work. But in an industry like ours where our crews are operating power machinery on customer properties, that risk is significant. Safety and management programs—including drug screening and background checks—reduce risk for the buyer, for us as a company, and for our employees. We take safety very seriously. As a result, we have very good safety ratings. One of the most common methods for determining the effectiveness of a safety program is a measure called the experience modifier. Right now our experience modifier is .76, which is much lower than the average—and we plan to keep it that way! 7. We promise to self-audit our work and correct any deficiencies in a timely manner through our Service Audit and Issue Resolution processes. Our customers want to know that when they hire us we will meet certain standards for excellence and perform our services as promised. We approach every job with the intention and expectation that we will do this successfully the first time around on every job. However, this is the real world and things will go wrong from time to time. In anticipation of this, we have proactively put into place standards and procedures for how we will respond in the event of a mishap. We also have quality control audit systems in place, to ensure that we approach every situation responsibly and with the highest degree of fairness and integrity possible. 8. We promise to use pesticides responsibly by employing licensed pesticide applicators who are supervised by licensed pesticide operators. In Kentucky, only licensed pesticide applicators working under the supervision of licensed pesticide operators can apply fertilizers, herbicides and pesticides. And, these individuals can only apply products according to the instructions on their label. We believe our customers care about the children, pets, wildlife, and pollinators on and around their properties. That is why we employ 27 licensed pesticide applicators and operators. 9. We promise to promote green infrastructure and the design and management of eco-friendly landscapes. Traditionally, the landscape industry has sold its value on curb appeal. While aesthetics are important and do significantly impact the value of a property, curb appeal is just the tip of the iceberg when it comes to the value a landscape can provide not only to property owners, but also to our communities and environment. When designed and constructed correctly and with awareness of environmental impact, the landscape can provide a greatly enhanced set of services above and beyond aesthetic appeal. 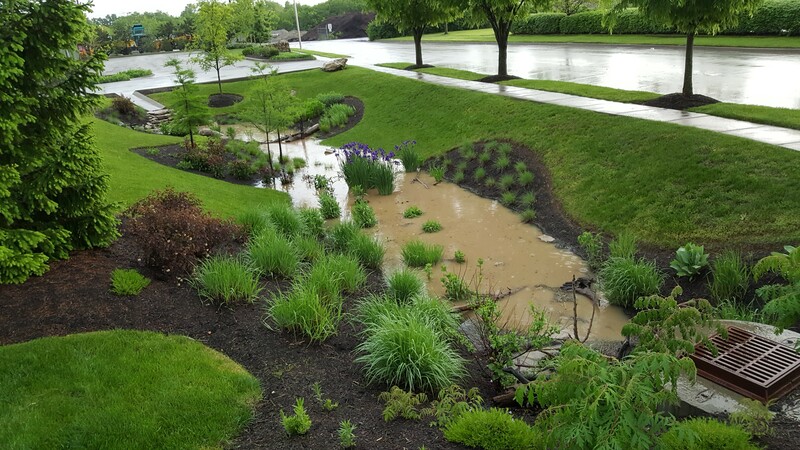 For instance, a well-designed and maintained landscape can provide natural habitat for native species and pollinators; reduce energy consumption; reduce stormwater runoff and improve water quality; improve human health; reduce levels of crime and blight; and many other benefits. At Klausing Group, we recognize that as landscape providers, we are in a unique position to impact society in a positive way through the landscape. We believe it’s our role to promote the positive benefits that can be achieved in this way. 10. 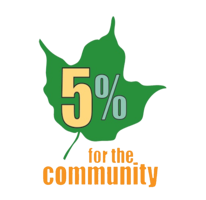 We promise to donate a portion of our profits to the communities in which we live and work through our 5% for the Community program. We give back 5% of our profits to organizations that benefit the communities in which we operate, whether directly or in kind. We recognize that giving back is part of being a good citizen. Since 2001, We’ve donated hundreds of thousands of dollars to causes and organizations. There is always risk involved when purchasing from a new service vendor. But the biggest risk comes from those things you may be unaware of about the industry in question. In creating our Brand Promises, we have done our best to bring to light some of the most common issues pertinent to the landscape industry—and to not only pledge to uphold the highest standards for this industry, but to prove that we are walking the walk as well as talking the talk. If you are looking for a commercial landscape vendor you can trust, and would like to know more about our services, please do give us a call at 859-254-0762 or get in touch with us here. We’ll be happy to discuss how we can best help you meet your grounds maintenance goals.